It was pretty warm and sunny yesterday, but it didn't last for another day. Whipping up something fast and getting a snap shot of it using natural light is hard to endure on these dispirited days. I was lucky enough to make something really quick and use the natural light for my photo shoot. Even though I grumble a little when it gets too hot on summer, I still prefer summer with birds chirping in the yard and enjoy the splendid colors of the flowers in my garden. I love to watch winter from inside, wrapped in my cozy blanket enjoying a hot cup of Chai. Speaking of winter, I just heard from my brother in NY, that they got 3 inches of snow today. I am definitely not ready for it yet despite of the fact that it will be making its way to east. 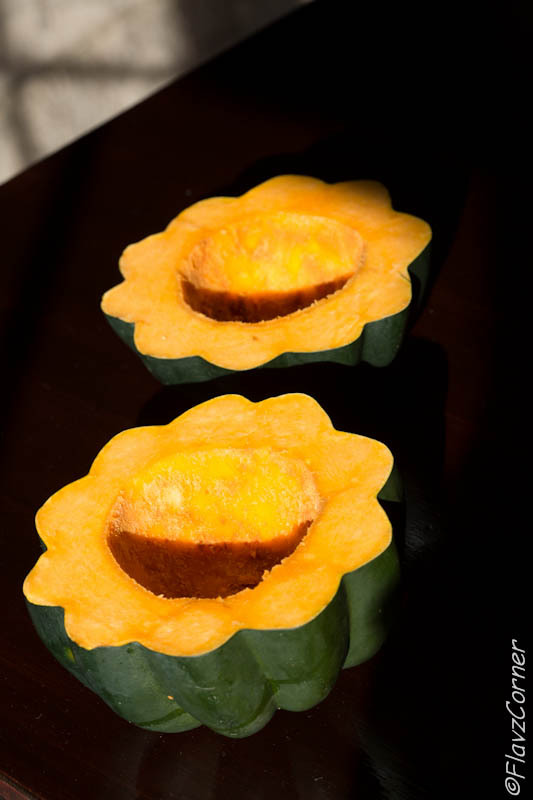 Squashes come in variety of shapes and acorn squash is fascinating in its own ways. The dark green skin and the dark orange flesh furnish a charming aesthetics to the vegetable. Acorn squash is very low in Saturated Fat, Cholesterol and Sodium. It is also a good source of Dietary Fiber, Vitamin A, Vitamin B6, Folate and Magnesium, and a very good source of Vitamin C, Thiamin, Potassium and Manganese. The glycemic load of 1/2 cup cooked acorn squash is 3 and the glycemic index is 41, which makes it a good source of carb with lots of fiber. I still have some green chards and collard green in my garden. So I decided to make use of the green chard in the traditional acorn squash soup and give uplift with some nutmeg. No exaggeration, it was really an appealing blend of tastes in one bowl of soup. 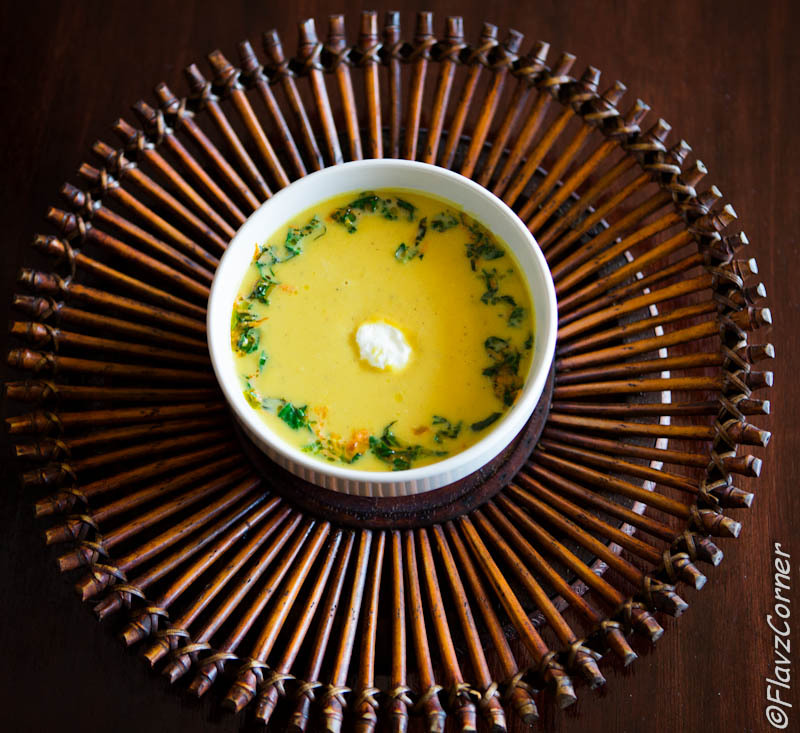 I was little skeptical about how to lure my little ones to the yellow and green soup. So I tried to spoon to my little one (Noah) and he smacked his lips instantly which signaled the approval. My whole family loved the soup. Here is the recipe of the acorn squash I made. Take a heavy bottom sauce pan and lightly brown the thinly sliced shallot in 1 tsp of oil. Add the chopped green leaves of the chard and grated carrots and cook for 1 -2 minutes till the leaves are slightly wilted and remove them from the pan and transfer the garnish to a bowl. Use the same sauce pan and add 1 tsp of oil and cook the garlic till golden brown followed by chopped onion and chard stem. Add nutmeg, salt, pepper and chopped squash and saute for 5 minutes. Pour in the vegetable stock to pan; cover and cook on low heat for 20 minutes. Turn off the burner and let it cool. Transfer to a blender and puree it. Add the half cup of yogurt and blend again. Add water (cooled boiled water) for desired consistency. 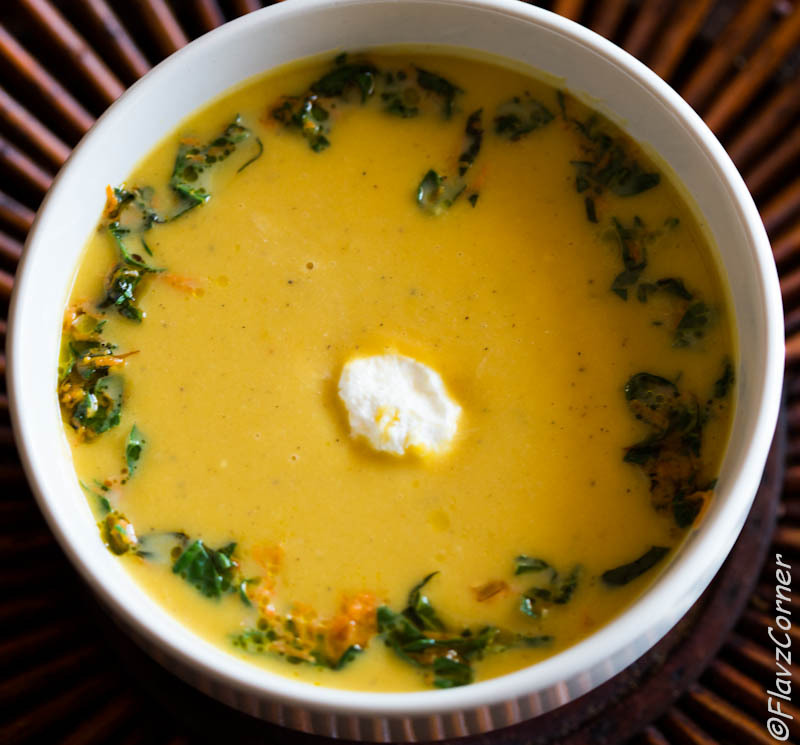 Transfer to a bowl and garnish with the sauteed Swiss chard and carrot and top with a dollop of sour cream or low fat yogurt. You can use vegetable stock instead of water to loosen the soup. Don't skip the roasting of garlic step; it gives a nice flavor and aroma to the soup. Such a flavorful and healthy soup...i love the flavor of roasted garlic- yum! !